The Cable Scope is a versatile test system that measures the frequency response of a cable system's return path. Unlike conventional sweep systems, which only find the magnitude portion of the frequency response, the Cable Scope provides both magnitude and group delay information. Using a powerful but short duration burst reference signal, the complex frequency response is determined by digital signal processing a received impaired reference signal with a stored reference signal. In addition to burst-testing the return plant for frequency response, the system can be used to measure the clipping level of the return plant. Operation: The technician carries a HE2M Reference Signal Transmitter to the field and connects it to a tap. The technician then presses the transmit button which sends a 5 µs trigger burst at 25 MHz, followed by an 18 µs. burst reference signal. At the headend, the trigger burst passes through a bandpass filter and triggers a TDS-1002 digital oscilloscope. The triggered oscilloscope captures the impaired reference signal. A PC running Holtzman Cable Scope software automatically downloads the trace and processes it with the stored reference signal. An operator in the headend communicates with the technician in the field and runs the Cable Scope software. The use of a PC allows printing, file storage and retrieval for further analysis. One further analysis step is exporting the Cable Scope trace to a program called "EYE". EYE is a software utility that estimates the MER that would occur if a 16-QAM or QPSK DOCSIS®-like burst were transmitted through the measured signal path at a selected frequency. That is, the MER is found by running a simulated packet through the measured channel. Below is a picture of the components comprising a Cable Scope test system. 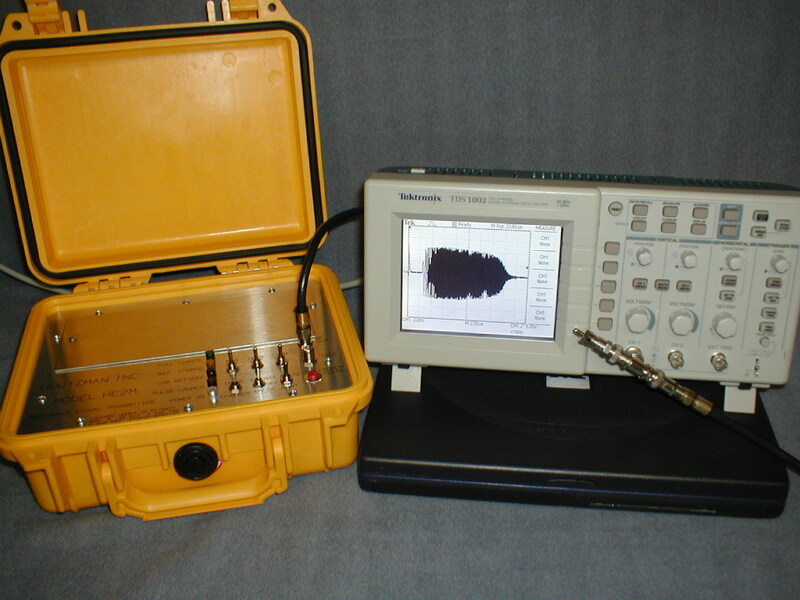 Required are a HE2M transmitter, a TDS-1002 Tektronix oscilloscope with a communications module, a PC that is connected to the oscilloscope, and Holtzman Cable Scope software. Not shown is an amplifier-filter assembly that interfaces the oscilloscope with the upstream fiber receiver. Below is a screen dump from a trace produced by the Cable Scope. The second trace from the top is magnitude vs. frequency, The third trace down is phase vs. frequency (180 deg. to -180 deg.) and the bottom trace is group delay vs.frequency for a cable system. This test cable system included a cascade of 12 amplifiers. The group delay is the slope of the phase plot. The top plot is an implse response, which is a time domain plot showing how the system would have responded to a voltage spike. The red and blue lines lines are marker frequencies. Below is an EYE simulation of a 16-QAM burst occupying the 3.2 MHz bandwidth centered at 35 MHz on the Cable Scope plot above. The lower two plots are inphase and quadrature eye diagrams. The upper left plot is a constellation diagram and the upper right plot is a vector diagram. Note that the MER is 19.11 dB, which is barely passing. Excessive group delay caused most of the linear distortion. Another use for the Cable Scope HE2M transmitter is measuring house and drop coaxial wiring integrity with a device called the Cable Clothespin®. In this test, the HE-2M transmitter drives the Cable Clothepin. If there is a shield break, the return spectrum at the headend will show the break. In this mode, the Cable Scope transmits a train of test signals into the Cable Clothespin, instead of just a single burst. If a conventional spectrum analyzer is used to display the image, the PC running Holtzman software is not required. See the Cable Clothespin® page for more details. US patents 5990687, 6140822, 6,151,559, and 6,344,749, and protect this technology.